Omrons smallest and most compact nebulizer for individuals with Asthma, COPD, or other respiratory disorders. This new portable MicroAir Nebulizer weighs only 6 ounces including the 2 AA batteries! The electronic Vibrating Mesh Technology (VMT) creates a dense therapeutic aerosol that assures effective and efficient delivery of medication. 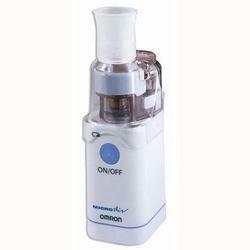 This Omron nebulizer can be used with undiluted medication and can cut treatment time to under two minutes. This revolutionary new nebulizer is totally silent and operates in virtually any position, which simplifies treatment, especially with infants and children. Any standard sized aerosol mask or mouthpiece can be used with the NEU-022V nebulizer. The NEU-022V nebulizer can operate continuously for over four hours (about 40-50 treatments) on two AA batteries. The metal alloy mesh cap is durable and resistant to corrosion and free patient instruction video demonstrates proper care and cleaning techniques.